Every day is like an unintentional treasure hunt. Every so often, usually when I need it most, I’ll stumble across something that I didn’t know, or remember, I had—and it will make me sad. Then come some tears that will slowly convert to a feeling of joy along with a smile. Talk about a roller coaster ride in a matter of seconds. I spend a lot of time reading philosophy and writings by Buddhist leaders and scholars. I had made a hot cup of tea, put my reading glasses on (on top of my contact lenses), and pulled out "How To Practice: The Way To A Meaningful Life" by the Dalai Lama. Out fell two Christmas cards. One was from Pete to me, and the other was addressed from me to him. I’m not sure what year they were from, but it was a few Christmases ago. I went through my usual cycle. My heart skips a beat and I’m instantly sad as I realize these are treasures I won’t again receive. Tears well up. Then gratitude overwhelms me. How lucky I am to have had a husband who would give me such beautiful cards every year. He put so much thought into picking the right message. What good fortune to have found this. Then I’m happy and I feel a smile move across my face. I’m consciously aware that I can make the choice to either go downhill emotionally at this point, or I can feel a huge amount of gratitude that this card surprisingly fell into my lap. In the weeks following Pete’s death I hoarded everything I could get my hands on. I put the word out, and friends, family, and fans sent me photos of Pete in so many different scenarios. I pondered over every one of them. Printed some. Framed some. Shared some on Facebook. Catalogued others. My life (from the previous 18 years) passed before my eyes. I emotionally re-lived every moment that was put in front of me via photos, old emails, and voicemails I was able to retrieve. I exhausted all sources…but one–the nooks and crannies of our own home. So things keep resurfacing. A few weeks ago I was dusting Pete’s writing desk and opened a drawer to find a photo of the two of us that was taken at the Schermerhorn Symphony Hall following one of Pete’s performances. Those are even greater gifts—when I’m in the photo too. The photo quality wasn’t great, but it was good enough to capture the moment and reflect the genuine love we had for each other. Last week I came across some old rolls of unprocessed film. I used to buy my kids those disposable Kodak cameras to use on vacation. When they were younger there were usually a good number of photos of their feet or of their finger over the lens. But every now and then they captured something beautiful. 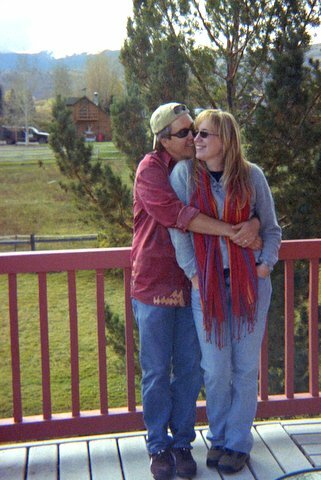 In this particular batch that I just processed, there was a photo of Pete with his arms wrapped around me out in the snows of Snowmass, CO. Imagine my joy! (and tears and smiles and gratitude—you know the drill). What are some of your found things?